Steve Baker was born in Wales, emigrating to Australia with his parents at the age of two. Art was always the dream and passion Steve lived for as a young school boy. However, in the 1960’s art was not typically seen as a practical career to follow. Steve left school at 16, gaining a job at a shoe factory. With every cent that he saved he would buy art supplies. However, he did not have access to quality art supplies and the lavish art supplies stores we have now. He would head down to the local travel goods store that had a small stand of supplies and purchase his creative tools. Heavily inspired by Geoffrey Smart and Salvador Dali, Steve began on a similar path with his paintings reflecting his favoured surrealism style. One of Steve’s first paintings that he considered to be a complete piece of work was kept by his biggest fan, his late mother Florence Edna May Baker. Steve reacquired this piece of art when his mother passed. Steve still has this painting and cherishes the memory of his mother. Whilst his father did not agree with the art scene, his mother always believed in his vision to become an artist. He surrounded himself with musicians and like-minded, creative souls. 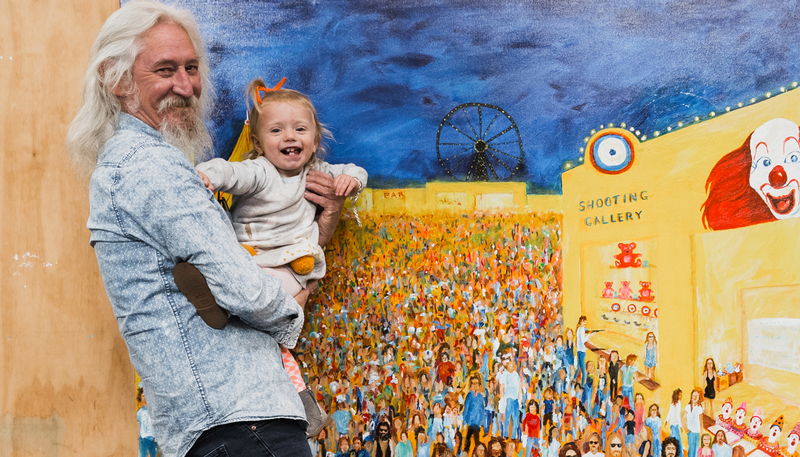 When Steve and his family were established and secure in life, his wife and eldest daughter wanted to hold on to the years of artwork and family legacy Steve built. They located as many of the original buyers as they could of his artwork and bought back a majority of his paintings. They have been re-framed and now hang in the family home. Steve is a family man with four children and four grandchildren to whom he devotes all his time when he is not painting. Two of his daughters have followed in his footsteps and are quite the over-achievers in the art world, with Steve proudly speaking of their achievements. Both daughters paint large scale abstracts and have taken a completely different direction to their dad’s style. However, they have started creating collaborative pieces combining their different outlooks on abstract art. This collaboration reminds Steve of the early days when the family always had an old trunk full of art supplies and all four children would paint with him – and as they grew older steal his art supplies! Today, Steve battles with macular degeneration which he has harnessed with his realistic artwork, changing to a free style of art. Whilst he was initially feeling unmotivated after the substantial loss of his vision he has been re-inspired to pick up the paint brush and escape the world of normality and rules.